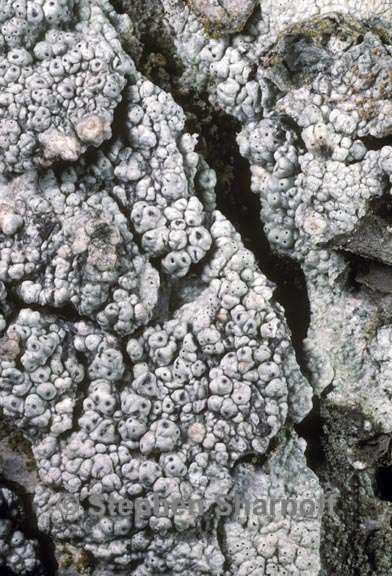 Thallus: continuous to weakly fissured, with thin to moderately thick verrucae; margins: entire, unzoned upper surface: whitish gray to ash gray, smooth, shiny, epruinose; lacking soredia or isidia fertile verrucae: concolorous with thallus, ampliariate or pertusariate, numerous, often fused, c. 0.5-2.2 mm in diam; ostioles: 1-8 per verruca, blackish brown, sunken Apothecia: 1-7 per verruca; epithecium: dark brown to red-brown, K+ violet; hypothecium: yellowish asci: cylindrical, 250-450 x 45-90 µm, (1-) 2-spored ascospores: hyaline, ellipsoid to fusiform, 95-210 x 35-55 µm; spore wall: 2-layered; outer spore wall: c. 1-5 µm thick; inner spore wall: c. 2-12 µm thick Pycnidia: not seen Spot tests: K+ yellow, C-, KC-, P+ yellow to orange, UV- or + orange-pink Secondary metabolites: stictic acid and 4, 5-dichlorolichexanthone (both majors) and constictic acid (minor). Substrate and ecology: Pertusaria consocians grows primarily on conifers (including Abies) World distribution: endemic to North America, where it is relatively common in the East Sonoran distribution: coastal mountains of southern California. Notes: Pertusaria consocians is a gray lichen with ampliariate or pertusariate verrucae with dark ostioles, 2-spored asci, ellipsoid to fusiform ascospores, and stictic acid and 4,5-dichlorolichexanthone. It is very similar to the European P. pertusa (Weigel) Tuck. and the differences between these taxa have been discussed by Dibben (1980).